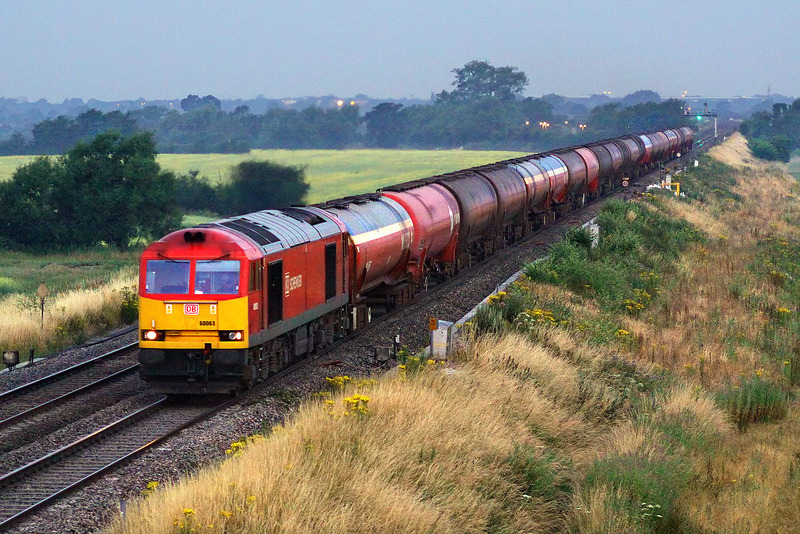 60063 worked the diverted 6A11 22:49 Robeston to Theale Murco oil tanks on 18 July 2013, bringing the unusual sight of an eastbound loaded oil train to the Vale of White Horse line. I had a cunning plan to photograph this at Bourton, just after sunrise, with the very first light illuminating the train. Unfortunately, it ran fifty minutes early, which meant it passed me well before sunrise! So, purely for the record, and with apologies for the very poor technical quality, here is 60063 passing Bourton in the darkness, with some of the lights of Swindon visible in the background.